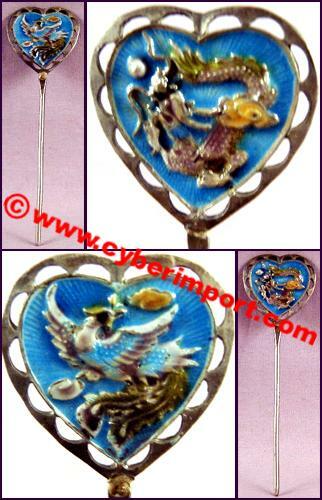 This hatpin or brooch features an enameled bat. Made of pure silver, about 92.5%. 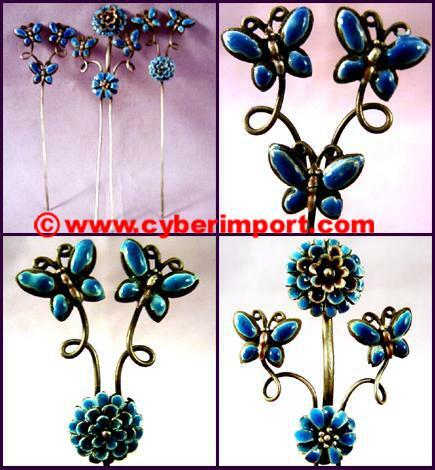 The enamel process is a bit like cloisonne, but more sophisticated. 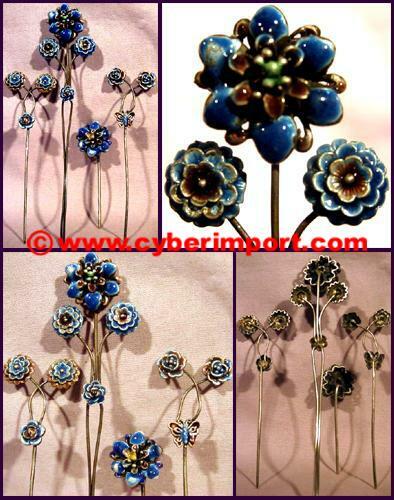 A bit short for a hair stick, it would work well on your clothing or hat. hpsl001-b $1.83 50 2 1 1/2" x1" x1/4"
This is made of pure silver, about 92.5%. Rooster at the end. 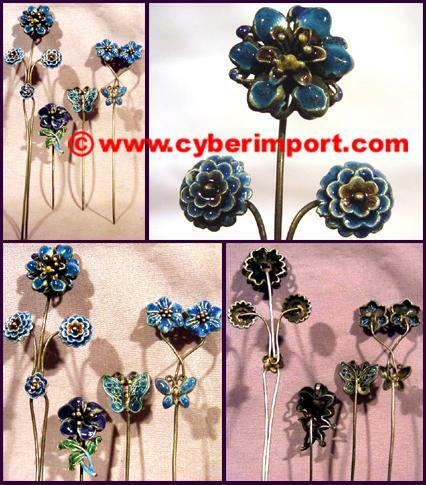 The enameling is a process much like cloisonne. Short piece for the hair. 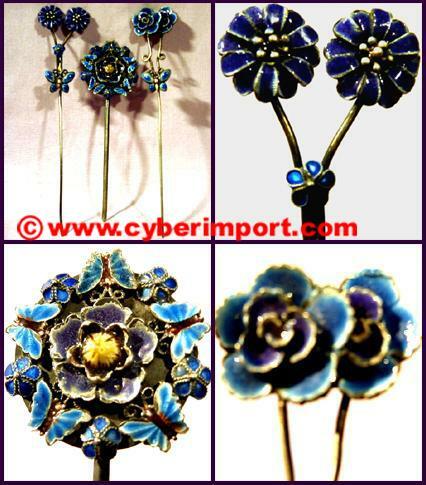 Could also be used as a brooch or hat pin. hpsl002-b $1.83 20 2 2 5/8" x1/2" x1/8"
This is made of pure silver, about 92.5%. Bat at the end. 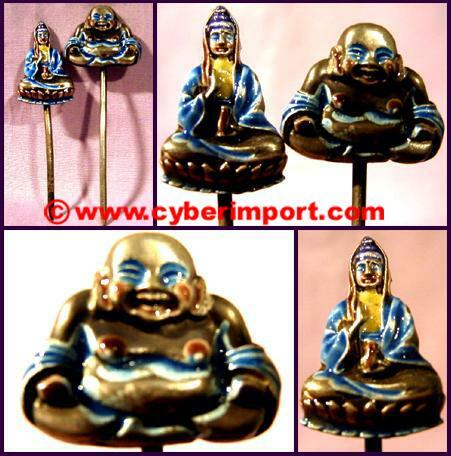 hpsl003 $14.63 5 8 4 5/8" x1 1/8" x1/16"
This is a set of three hair sticks from China. 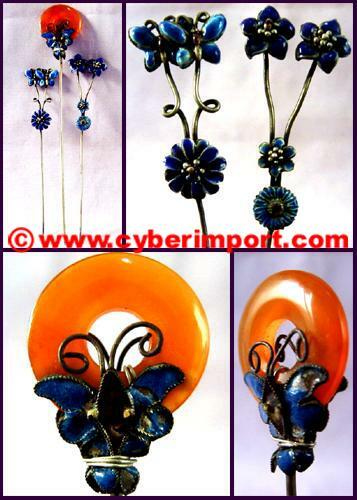 All have butterfly floral themes. This is made of pure silver, about 92.5%. 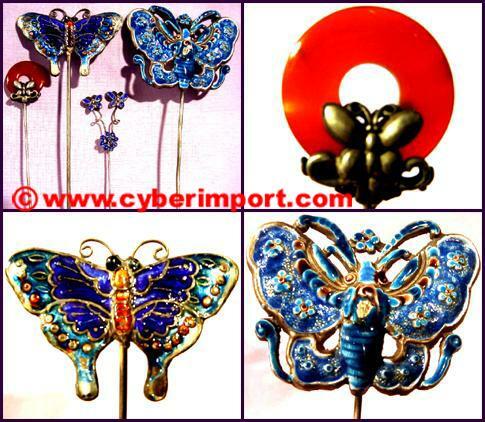 Each is enameled with a process much like cloisonne. Short pieces for the hair. 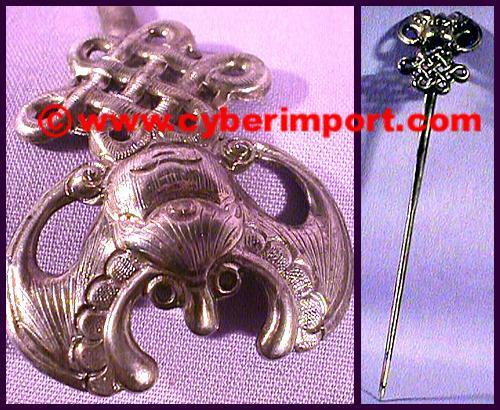 Could also be used as a brooch or hat pin. hpsl004 $7.32 15 14 3 1/2" x1 1/8" x1/16" ~ 3 3/4" x1 1/4" x1/8"
hpsl005 $7.32 15 16 3 1/4x1 x1/8"~ 4 x15/16 x1/16"
hpsl005-2 $7.32 15 16 2 7/8" x1 1/8" x1/8" ~ 3 7/8" x1" x3/16"
This is a set of two hair sticks from China. Both are Buddha themes. This is made of pure silver, about 92.5%. 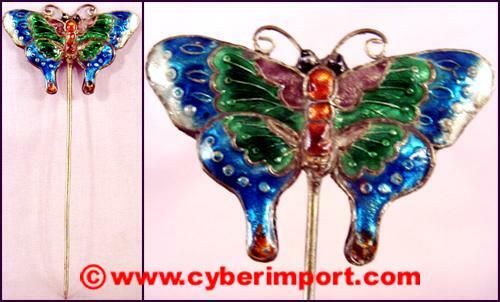 Each is enameled with a process much like cloisonne. Short pieces for the hair. 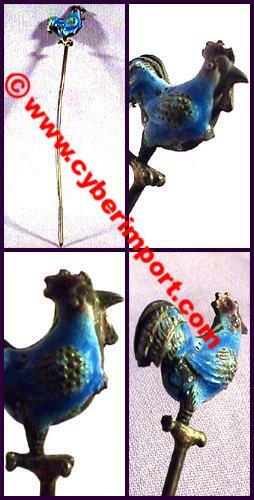 Could also be used as a brooch or hat pin. hpsl006 $7.32 14 10 2 3/8" x3/4" x1/4" ~ 2 5/16" x15/16" x1/4"
hpsl006-2 $7.32 14 10 2 3/8" x3/4" x1/4" ~ 2 5/16" x15/16" x1/4"
This is a set of four hair sticks from China. 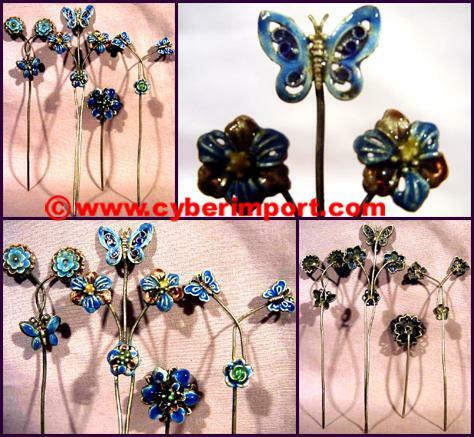 All have butterfly floral themes. Put up your hair like an empress. This is made of pure silver, about 92.5%. 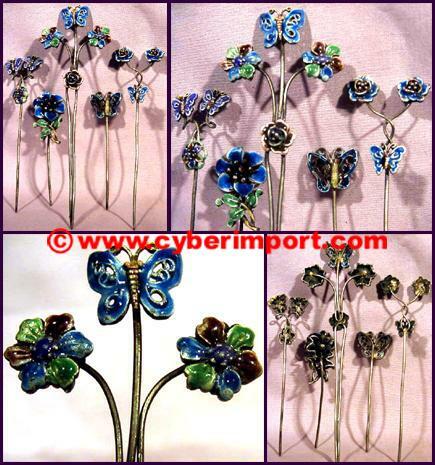 Each is enameled with a process much like cloisonne. Once piece with natural agate stone. 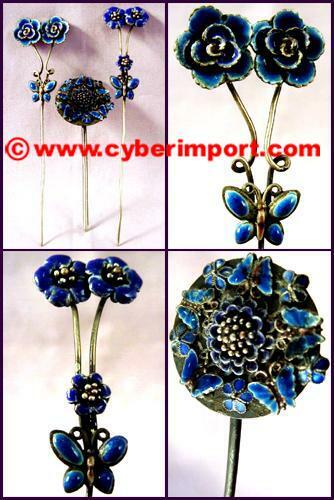 hpsl007 $7.78 16 40 2 11/16" x1 1/8" x1/8" ~ 7 5/16" x2 5/8" x1/8"
These hair sticks from China are made of pure silver, about 92.5%. Floral and Butterflies adorn all. 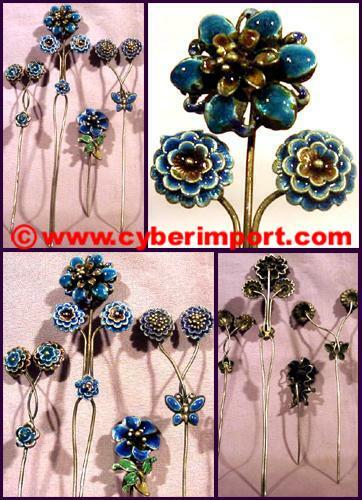 The enameling is a process much like cloisonne. 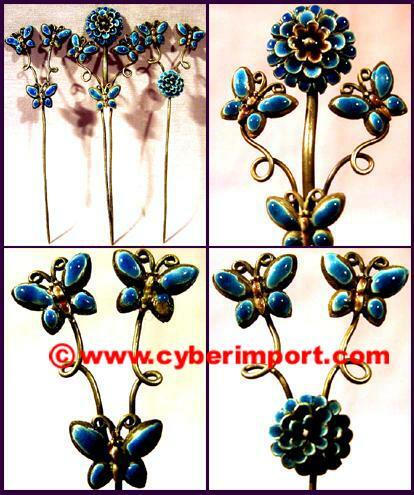 hpsl008 $7.32 15 14 3 5/8" x1 1/8" x1/8" ~ 3 7/8" x1 5/16" x1/4"
This is a set of three hair sticks from China. 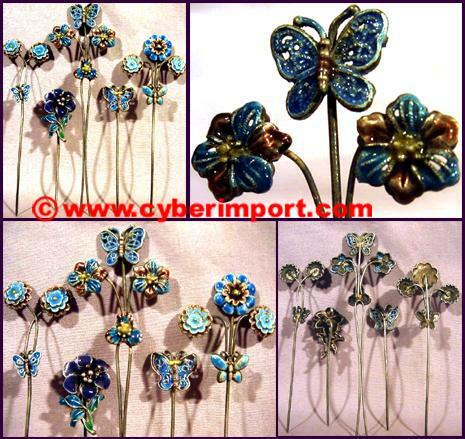 All have butterfly floral themes. This is made of pure silver, about 92.5%. 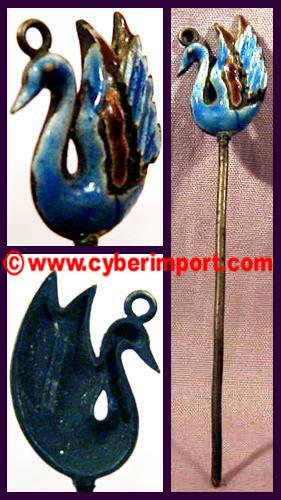 Each is enameled with a process much like cloisonne. Once piece with natural agate stone. 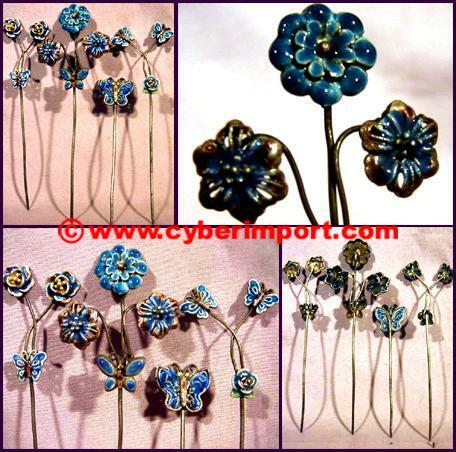 hpsl009 $7.32 15 14 3 3/4"x1"x1/8"~5"x1"x3/16"
This is a hair stick from China. Swan theme. Put up your hair like an empress. This is made of pure silver, about 92.5%. 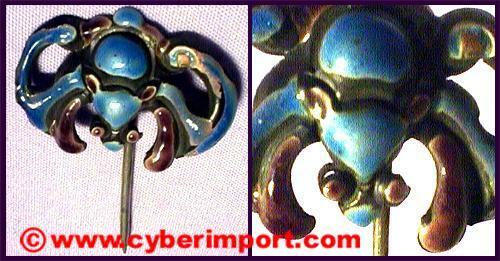 Enameled with a process much like cloisonne. hpsl010 $5.49 15 4 2 11/16" x1/2" x1/16"
hpsl011 $5.03 20 20 2 1/4" x11/16" x7/16" ~ 4 3/4" x1 1/4" x5/16"
hpsl012 $5.12 25 18 2 3/8" x5/8" x1/16" ~ 4 1/4" x1 7/16" x3/16"
hpsl013 $5.49 20 20 2 1/8"x3/"x1/2"~4 3/4"x1 1/8"x3/8"
hpsl014 $5.49 20 22 2 1/2" x11/16" x1/2" ~ 4 1/8" x1 3/8" x1/4"
hpsl015 $5.49 20 18 2 3/16"x3/4" x3/8" ~ 4 1/4" x1 5/16" x3/16"
This hair sticks from China is made of pure silver, about 92.5%. Dragon theme. 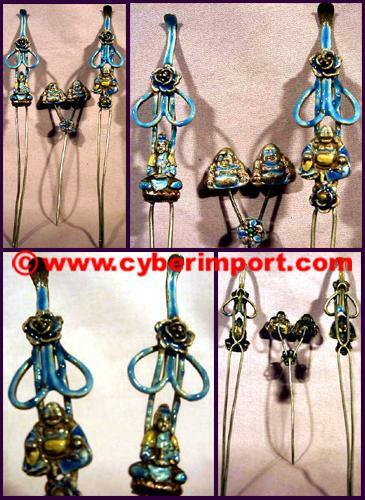 The enameling is a process much like cloisonne. hpsl016 $3.66 25 6 2 15/16" x1 1/8" x3/16"
hpsl017 $5.49 20 16 2 5/8" x5/8" x1/16" ~ 3 7/8" x1 3/8" x1/8"
These hair sticks from China are made of pure silver, about 92.5%. 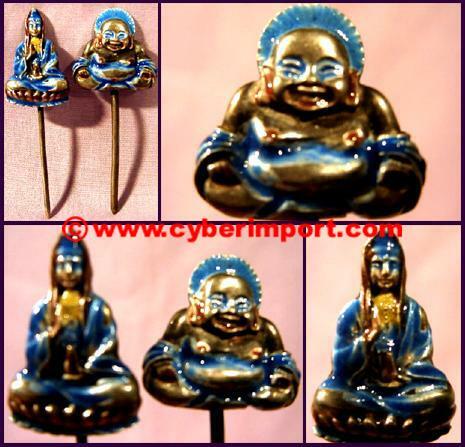 Buddha themes. 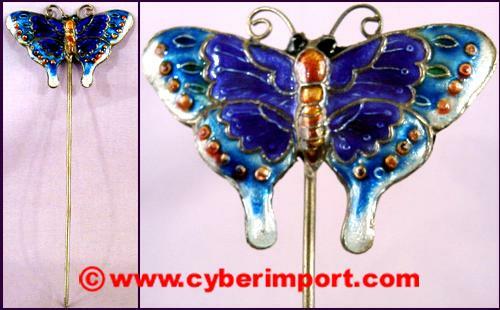 The enameling is a process much like cloisonne. hpsl018 $7.32 15 22 3 3/8" x1 3/16" x1/8" ~ 5 11/16" x3/4" x1/4"
hpsl019 $5.49 20 22 2 3/16" x11/16" x3/8" ~ 4 13/16" x1 1/16" x1/4"
This hair stick from China is made of pure silver, about 92.5%. Floral and Butterflies adorn it. 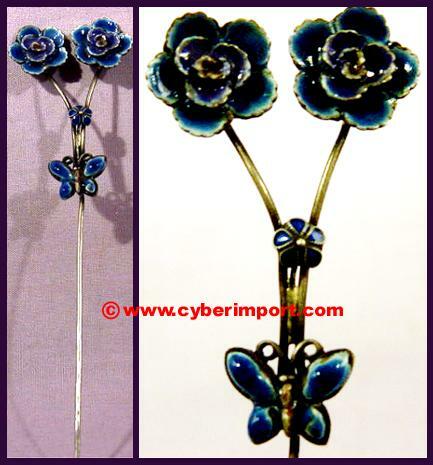 The enameling is a process much like cloisonne. hpsl020 $9.15 10 6 4 3/16"x1 1/16"x1/8"
hpsl021 $12.20 10 10 5 1/4"x2 3/8"x1/4"
hpsl022 $12.20 10 10 5 1/4"x2 3/8"x1/4"